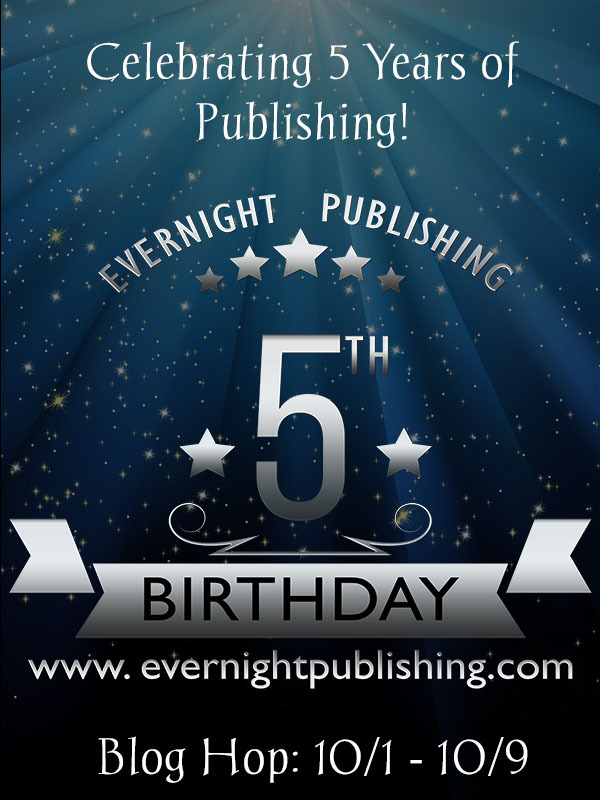 Happy 5th birthday to Evernight Publishing!! Congratulations on five years of publishing fantastic books – here’s to many more years and many more hot books!! Right then, to the best bit ~ a GIVEAWAY!! All you’ve got to do is leave a comment which includes the word ‘TASTY’ at the bottom of this post and I’ll choose five winners on Oct 10th when this blog hop is complete. The winners will receive a copy of A Taste For Three and I’ll announce the winners on my blog. Good luck! Thanks for reading and happy hopping! This entry was posted in Blogs and tagged A Taste For Three, All Romance Evernight sale, blog hop, Evernight birthday celebration, Evernight Publishing by rebeccablackwords. Bookmark the permalink. What a tasty post! Thanks for being a wonderful Evernight author! Just a taste of Nate, Jack, and Ellie is never enough. You’ll need more!! Or at least, I need more!! Have a tasty birthday Evernight! Thanks! What a tasty treat! Happy Birthday Evernight Publishing! Thank youi! Five years for Evernight Publishing. Wonder if their birthday cake at the party will be tasty ….. Thanks for participating in the blog hop. Thanks for being a part of this FAB and TASTY blog hop! What a tasty treat. Look forward to more. Looks like a TASTY treat to me! Thanks for participating in the 5th birthday blog hop! I love hops and birthdays! Meeting new authors and giveaways are just a bonus! Happy Birthday Evernight, hoping you had a TASTY birthday cake! I’m like a kid in a candy store with this blog hop. My wish list is getting filled up with so many TASTY new stories to try! Thank you for being part of the Evernight Birthday party hop! Your latest release sounds very TASTY. Happy Birthday Evernight your books are very TASTY!! Love the tasty blurb! =D Happy 5! Thanks for the giveaway & Happy Thursday! Happy Birthday, Evernight! Hope you cake is very tasty! All of the covers I’ve seen from Evernight are soooo tasty!!! Sounds like a TASTY treat! Thanks so much!